As an academic, it is often very difficult to shut off the faculties I’ve spent the last fourteen years building. Since I spend almost every day of the week analyzing literature, reading or thinking about theoretical/philosophical texts, I generally use my brain in a very particular way. Turning that off is a chore, but a necessary one. In fact, it is often so difficult to turn off that even some of my colleagues have expressed dismay at the inability or unwillingness of other academics to turn those faculties off just long enough to have a “regular conversation.” It’s a problem I’ve seen, too, and it sometimes results in a distancing effect between those who can’t turn it off and those that can. Since I’m so often engaged in everyday sf/f fandom, the exercise of flipping that little academic switch is, in my opinion, crucial. One such exercise occurred last Sunday when I went with a friend to see Ant-Man, the last entry in Marvel Studio’s Phase 2. I thoroughly enjoyed it, and if I can muster the words to say something intelligent about the film, I’ll write a review for Totally Pretentious. Discussing the film on Twitter eventually prompted a brief discussion with David Annandale and John Stevens about the impact of “academic brain” on one’s ability to enjoy a creative product. For me, academic brain affects my ability to enjoy a film or book because the processes of thought involved are markedly different. Rather than simply approaching a creative entity with the intent of enjoying it for what it is, academic brain leads me to think about its cultural implications, the interactions between plot and character in the process of creating meaning, and, as in the image above, various levels of niche theoretical and philosophical thought. Instead of just having a pleasurable experience, the neurons in my brain fire in such a way that sometimes straight pleasure is impossible. None of this is to suggest that there isn’t something pleasurable in the academic experience. Indeed, as has been the case for Totally Pretentious, the movie podcast I run with David, thinking about the deeper meanings of film comes with its own pleasures. But I often find that sometimes academic pleasures can cloud non-academic pleasures when they are given primacy over the experiences I once sought when I wasn’t embedded in the academic atmosphere. This isn’t about simply reclaiming some kind of nostalgic childhood, but rather about preserving that part of me that came before academia. Sometimes, approaching a film for the first time as merely a film goer is enough. Sometimes, it’s even preferable. For that reason, I take great pains to isolate or compartmentalize my various forms of media engagement. When I want to simply enjoy a thing in the simplest sense of the term, I do whatever I can to shut off the critical faculties that would make that difficult. It’s not an easy task, and I certainly agree with David and John that it is perhaps fundamentally impossible in any pure sense; but turning them off, however difficult, is crucial to maximizing my experiences with media. For me, the idea of cutting off different kinds of experiences is like cutting off some of your senses. I want to experience things in a myriad of ways, and that means I sometimes want to watch a movie or read a book with the intent of simply enjoying it. Sometimes, I want to do the same thing with all my critical faculties on overdrive. It depends on the experience I want to have or the order in which I want to have them. All this ties into my personal desire to avoid loading up experiences with expectations. Academic brain comes with a number of expectations about what a film or book or whatever will or should offer; this is not unlike reading a lot of reviews, listening to what your friends say about a thing, and so on. Expectations aren’t necessarily a bad thing. Indeed, sometimes academic brain leads me to see things in a work that I might otherwise have missed, which comes with its own sort of pleasure. But coming into a thing with the wrong set of expectations can ruin experiences. I can’t count the number of times reading too many reviews led me to expect X from a movie, even though that movie really only offered Y. The same thing often happens when I read a book that a literary critic discussed in an essay; what they see is often not what I see, but the expectations of experiencing that “sight” influences my reception of the work in a way that dampens the value that work might have. I compartmentalize my various brains to avoid this problem as much as possible. When I saw Ant-Man, I knew only what the trailer told me: it would be a relatively funny and enjoyable superhero experience. No reviews. No academic ideas about the superhero genre. Just funny and enjoyable. 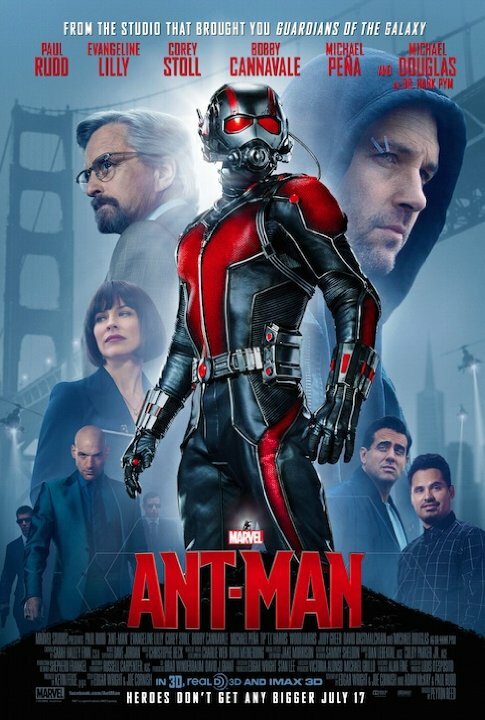 And I got far more than I bargained for; Ant-Man was not just one of the funniest Marvel movies I had ever seen, but it was also one of the most enjoyable superhero experiences I’ve had. It was just darn fun, dangit! Would keeping academic brain “on” have affected that? I don’t know. What I do know is this: not having academic brain “on” meant it couldn’t affect my initial experience. Not reading reviews didn’t affect the experience either. I got a pure experience — insofar as that is actually possible. And now I can go back with different brain bits at work. Next time, I can look at Ant-Man like an academic or a pop culture critic or something else entirely. And each time, the experience will be different. I think that’s a good thing.